Submitted photo The 15-year anniversary award was presented by Garry Abfalter, Greene County Master Gardener Volunteer President, Jerry Haun to Thais Reiff, Pamela Carter along with Trevor Corboy, OSU Extension Greene County Agriculture and Natural Resources Educator. XENIA — The Ohio State University Extension Greene County Master Gardener Volunteers held their annual banquet Nov. 13. The evening featured a great time to recognize all the accomplishments from the previous year. Master Gardener Volunteers teach environmentally sound, research-based gardening practices to the citizens of Greene County. The following volunteers were recognized for their continued contributions. 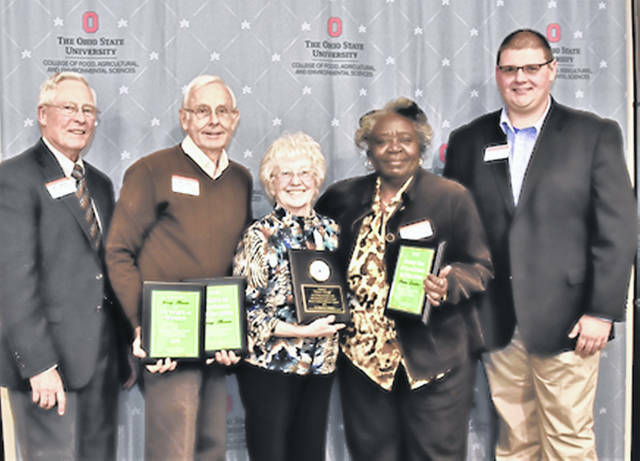 To learn more about OSU Extension or the Master Gardener Volunteer program, please visit greene.osu.edu or call 937-372-9971.
https://www.fairborndailyherald.com/wp-content/uploads/sites/50/2018/11/web1_Banquet.jpgSubmitted photo The 15-year anniversary award was presented by Garry Abfalter, Greene County Master Gardener Volunteer President, Jerry Haun to Thais Reiff, Pamela Carter along with Trevor Corboy, OSU Extension Greene County Agriculture and Natural Resources Educator.